There are many different laksas, but all are based on noodles cooked in a spicy coconut broth. Rich and creamy. 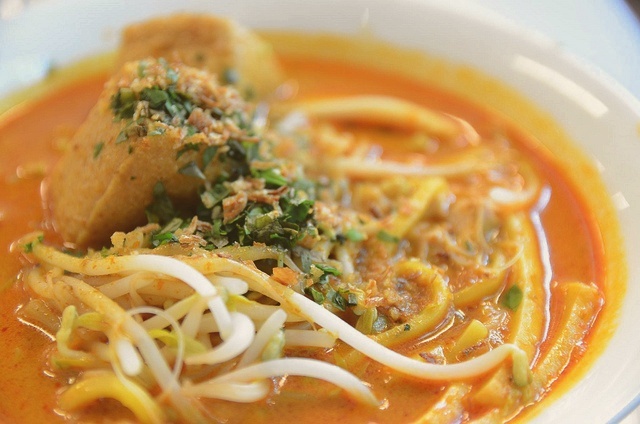 Singapore laksa marries the Malay, Chinese styles of cooking. Make spice paste, using a pestle and mortar or a blender to grind all the ingredients, except oil and sliced shallots. Bind paste with 1 tbsp oil and set aside. Heat enough oil in a wok to deep-fry shallots. Fry shallots until crisp and golden. Drain shallots onto paper towel and set aside. Discard the oil, reserving 2 tbsp. Heat reserved oil in wok and stir in spice paste. Cook over low heat for 3-4 minutes, until fragrant. Add coconut milk and chicken stock. Bring to the boil, stirring all the time. Add prawns, squid, scallops and clams, and simmer gently just until cooked. Season with salt and pepper. To serve, divide noodles among individual bowls. Add beansprouts and ladle broth and seafood over top, making sure noodles are submerged. Garnish with crispy shallots, laksa or mint leaves, tau pok and drizzle of chilli oil.